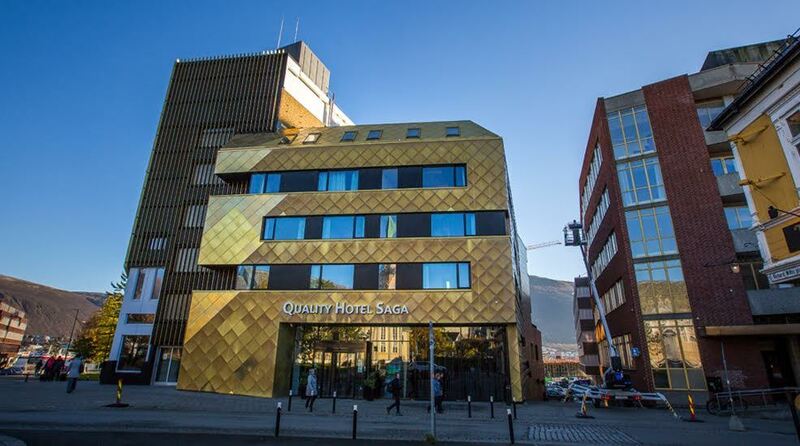 Quality Hotel Saga is a modern conference hotel situated in the middle of Tromsø next to the harbour and the airport express bus terminal. The modern rooms of the hotel offrers a fantastic view to the Ice Sea Cathedral, Tromsdals-peaks and Tromsø city centre. Tromsø Domkirke, North-norwegian art museum, and the Polar museum are all in walking distance, and ensures an excitingt stay in Tromsø. Here you can read a bit more about what to do while visiting Tromsø. The hotel was recently expanded and now sport a new restaurant, reception, and conference department. The latter consists of 7 flexible conference rooms with a capacity of 200 people in our largest room. Quality Hotel Saga is cash-free, which ensures added security for our guests and visitors. More information about this can be found under FAQs. The airport shuttle bus stops right in front of the hotel. Hurtigruten stopper 150 m fra hotellet.